can help maximize your business productivity and efficiency. Adoption of cloud technology has helped accounting firms transform into agile entities with the ability to take on their competitors. These firms have steadily realized that cloud technology provides various solutions to the critical issues such as remote access, data security and multi-user collaboration. When compared with the Traditional Accounting System, Cloud Accounting offers more flexibility in scaling and hassle-free operations. Accounting firms make the perfect candidate for cloud hosting as they require integrated use of applications for the accounting process. When connected with mobile devices, the cloud can provide anytime, anywhere accessibility which can be broadly beneficial in financial terms and streamline the everyday process. Security and financial data integrity provided by the cloud is state-of-the-art. Accountants have a real-time overview of their financial process. Software upgrades, maintenance, and administration costs are managed by the cloud service provider, which reduces upfront business costs. Cloud accounting eases cash flow of the company, as the expense for the accounting software is paid on a monthly basis. Data can be accessed from anywhere through Smartphones, Tablets or Laptops. Cloud enables firms to benefit from enterprise-class functionality at an affordable price that even small accounting firms can afford. 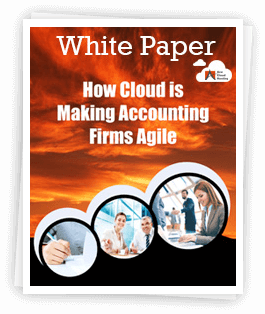 This whitepaper takes a closer look at the factors driving rapid adoption of cloud technology by accounting firms. In addition to this, the whitepaper discusses some challenges that come in the way of promoting Cloud Accounting as the accounting firms are not fully aware of the implications of adopting cloud environment for their accounting process.